Yesterday I decided to try out a new tool that others were talking about on Twitter to create images for presentations or to just share out. Unfortunately that tool had a lot of paid features and that means it will most likely not be one I would suggest to other teachers, unless those paid features are great, which these weren’t. So I decided to go back and try what I was thinking using a tool I had been trying out lately, Piktochart. Piktochart is really useful for making images with text and other graphics in order to display information or to get a point across. It is a really useful tool to create infographics. 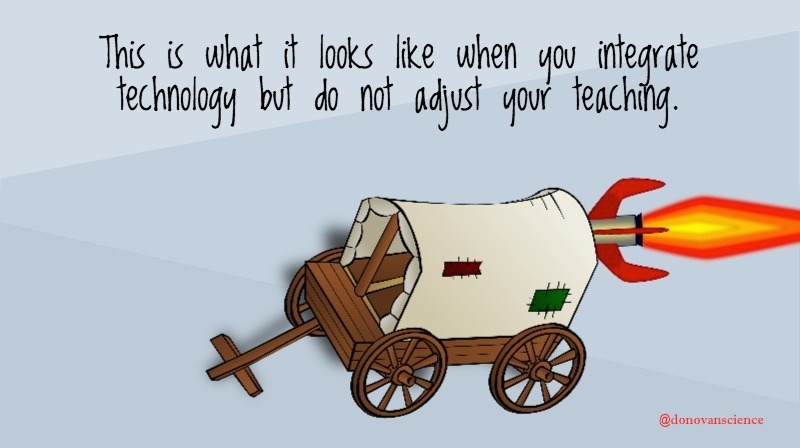 The image that I created was one that was in my head a lot lately, mainly that of what happens when we start to try to integrate technology into our classrooms but our instruction (pedagogy) does not change. To me, that has always looked like strapping a rocket to an old covered wagon. While the wagon may go faster for a bit, it is not designed to handle that rocket and it most likely will end up in a burning heap of disaster. If we really want to integrate technology into our learning environments, then we must review our pedagogy and make those necessary changes in order to actually improve the learning. The interesting thing that happened after I tweeted out this image was not how quickly it was retweeted by others, but in how quickly those retweets of a retweet of a retweet ended up in my name being removed from the original post. For my first tweet of the image, I had not added my name to the original image itself but I did add it later and tweeted that out. So if you saw a retweet of a retweet of a retweet, there was very little chance you would know where that image came from and that is the interesting part. We so often lose track of who created those images that we are so quick to retweet out and many do not think about it, I know this has happened to me in the past and may even happen again. If you are worried about getting proper attribution, make sure to put your name on the image somewhere.